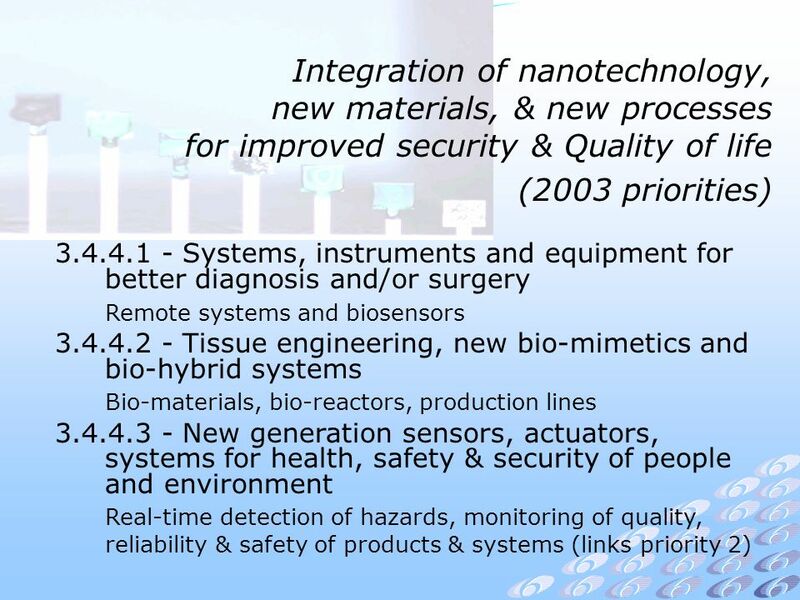 6th Framework Programme Implementation of Priority 3.4.4 Integration of nanotechnologies, new materials & new production technologies for improved security. 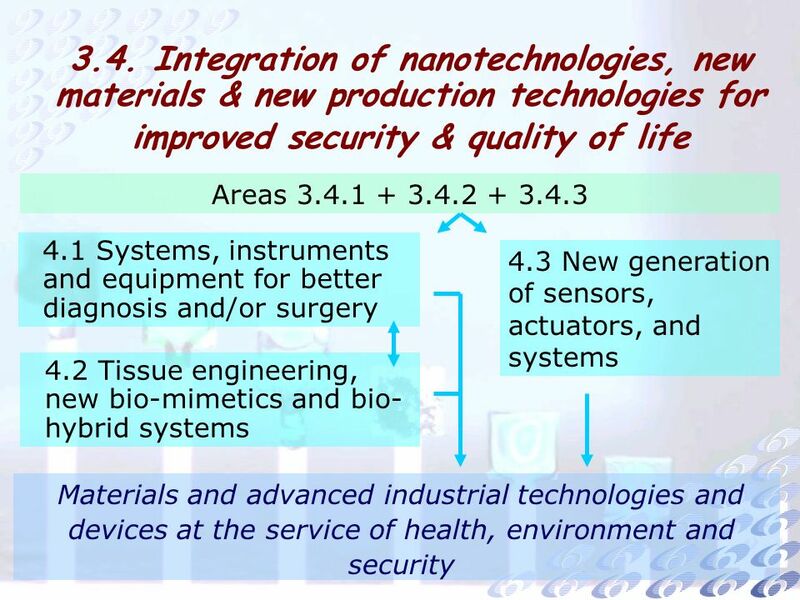 Download ppt "6th Framework Programme Implementation of Priority 3.4.4 Integration of nanotechnologies, new materials & new production technologies for improved security." 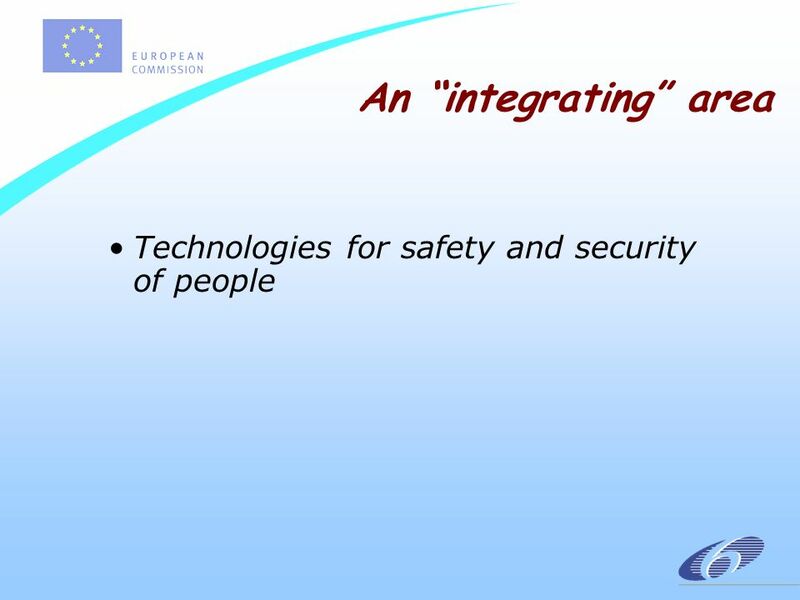 1 st December 2003, Milan Roundtable Discussion on the need for better co-ordinated actions at EU level Moderator: Hans-Werner Müller – UEAPME Secretary. Warszawa 18 luty 2004 The European Union Industrial Research Actions The nanotechnology, materials, production research area (NMP) Traditional instruments. 2/8/ :17 AM2/8/ :17 AM2/8/ :17 AM. Information Society Programme Trust & Security Trust & Security Unit Information Society Directorate-General. INTERREG III C: Past experiences and future expectations on Interregional Co-operation Brussels, Thomas Wobben Verbindungsbüro des Landes Sachsen-Anhalt. Illustrated Story on funding research Europides has got the instruments! 5 Framework Programme ( ) Information Society Technologies 5 th Framework Programme ( ) Information Society Technologies Key Action. European Commission DG Information Society Info Day Brussels, 2 June 2005 Instruments: purposes and modalities in the SO structure. SO Collaborative. 1 DG INFSO Directorate G: Components and Systems. 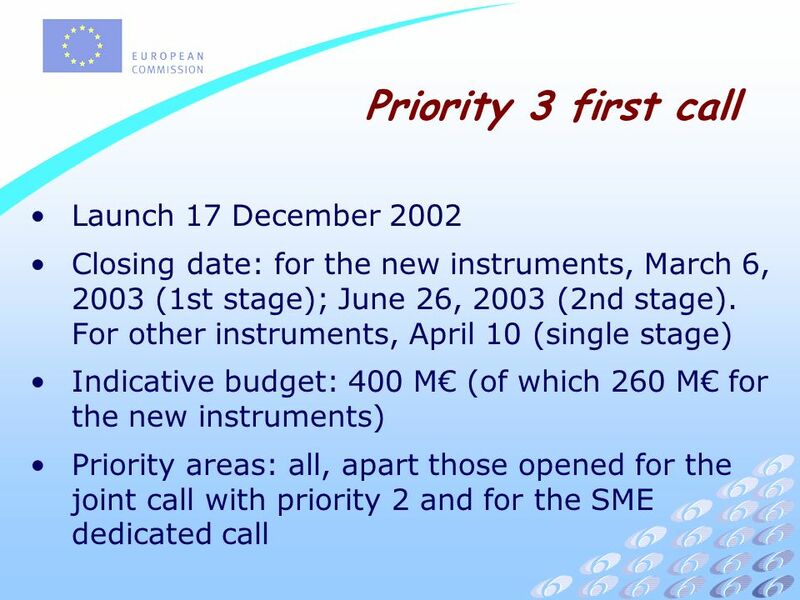 NH - Calls for proposals -23/10/02 1 Priority 3 Indicative first calls information Dir G - DG Research Brussels - 23 October 2002. 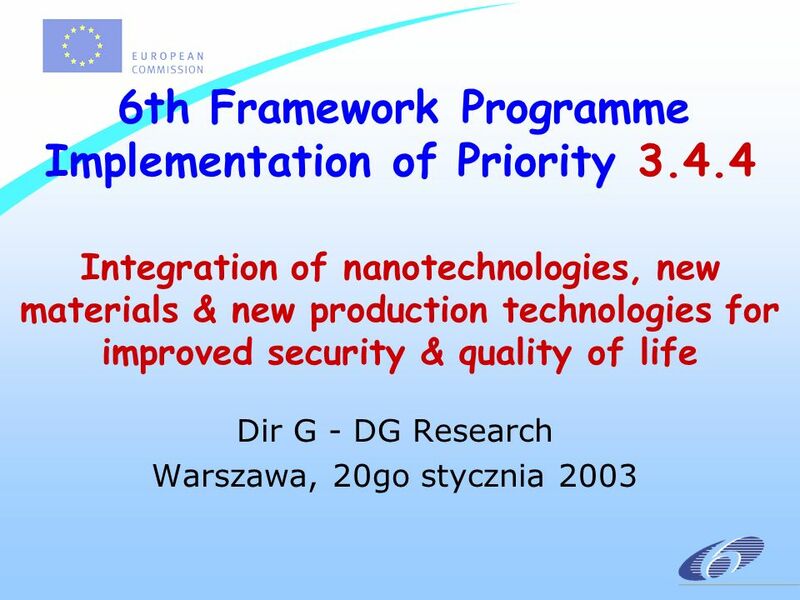 HP - NCPs - 23 Oct th Framework Programme Implementation of Priority 3 Dir G - DG Research Brussels - 23 October 2002. 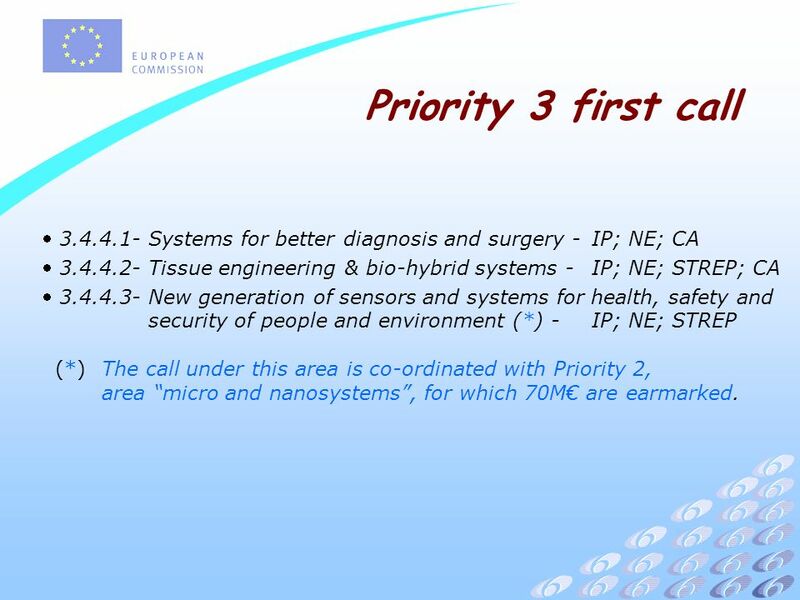 NH - NCP - 23/10/02 1 6th Framework Programme Introduction to Priority 3 Dir G - DG Research Brussels - 23 October 2002. 1 Opening Doors to the NHS Opportunities for Companies to build Working Relationships with NHS Organisations December 2 nd 2009 Professor Alan Barrell. 6th EC Framework Programme for Research Scientific Support to Policies: “Integrating and Strengthening the European Research Area” Area (i) Policy-oriented. RZ_to_ISTC_on_Call1_9Jul Project Co-ordinators Meeting Brussels, 17 July 2003 Response to Call 1 Erastos Filos Information Society Directorate-General.